Ray Gottlieb, O.D., Ph.D., FCOVD, FCSO, certified behavioral optometrist, graduated with highest honors from the University of California at Berkeley, School of Optometry (1964), earned a Ph.D. in humanistic psychology at the Saybrook Graduate School and Research Center in San Francisco (1978). His Ph.D. dissertation covered neurological and psychological aspects of nearsighteness improvement. He was on the clinical faculty at the Optometry School at U.C. Berkeley and a professor of optometry at the University of Houston College of Optometry (1965-68), on the learning skills development faculty at Santa Rosa Community College and on the faculty of the Sonoma State Mental Hospital in Sonoma, CA. Currently he is the Dean of the College of Syntonic Optometry (since 1979), is on the piano faculty of the summer music program at the Chautauqua Institution in Chautauqua, NY (training visual, attention and coordination skills of piano students to enhance their music learning ability) and is a Senior Clinical Associate in the Dept. of Ophthalmology, U of Rochester. Dr. Gottlieb has published articles on myopia, presbyopia, syntonics (color) therapy, behavioral optometry, brain trauma, education, and brain theory (the phase-conjugate, optical brain) and has written two books: Attention and Memory Training for Children and The Fundamentals of Flow in Learning Music (with Rebecca Penneys, professor of piano at the Eastman School of Music). In the early 1970's he eliminated his myopia using natural vision improvement exercises and then began teaching classes and workshops on this approach and opened a vision therapy practice near Santa Rosa, CA (1972-1981) and in San Francisco (1976-77) at the Center for Developing Conscious Vision (with Meir Schneider). In 1981 in Santa Monica, CA he started the Eye Gym, a gymnasium where members could workout to improve vision, coordination, attention and memory. He was research director for the Brain/Mind Bulletin, an international newsletter about brain research, creativity, education and human health and potential (1983-1991). He lives in Rochester, NY. 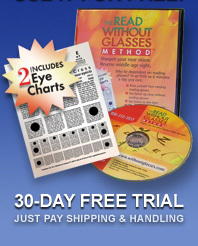 Try THE READ WITHOUT GLASSES METHOD™ for FREE for 30 days! This offer is not available in stores! order today!